Life carve doesn't help the lack of defenses, and it needs to hit to take HP. So against Xan for instance once he heals up you can't hit him and life carve is useless. Many Inn bosses can lower your hit chance or raise their defenses. DmK V1 lacks the versatility to get around shields. hat he meant by this is that it’s going to have the same (or similar) amount of Power on its Nuke, but will also come with repercussions such as a lack of defenses, and is yet to be implemented soon. Right now the nuke is way stronger than DmK Vengeance (both versions) because of the guaranteed crit (450 base multiplied by 175% = 787.5 >500 of Vengeance), without even taking into account the -60 all and +100 boost. A lot of misinformation and faulty logic has been posted in this thread, and finally one particular bit of a post has broken the camel's back and given me enough of a headache to respond. Right now the nuke is way stronger than DmK Vengeance (both versions) because of the guaranteed crit (450 base multiplied by crit >500 of Vengeance), without even taking into account the -60 all and +100 boost. Both DoomKnight classes have scaled base damage based upon their level. Vengeance only deals 500% damage if you are level 1; at level 90 it will deal 2100% damage. Inner Darkness for DoomKnight V2 will also deal 500% damage at level 1, and 1400% damage at level 90. Both DoomKnight classes are also capable of further increasing their damage through -res and Boost; the most blatantly overpowered example is V1's Wake skill (which sets the target's Darkness resistance to -100, Doompoch's -60 All pales in comparison). To suggest that Corrupt Doom Epoch's Final outdamages Vengeance is ridiculous. To suggest that DoomKnight V1 is not blatantly invincible against enemies not specifically designed to one-shot it is ridiculous. To suggest that Life Carve is anything short of an automatic win button is ridiculous. To suggest that Corrupt Doom Epoch "outclasses" DoomKnight V1 at anything is ridiculous. Nearly all of the posts in this thread regarding DoomKnight V1 are either badly misinformed or lack any semblence of basic common sense. I did not want to respond to any of these posts, but this entire conversation has been absolute nonsense and the thought of ridiculous misinformation like this being spread disgusts me. I am appalled. I forgot about the scaled damge and that is my fault. However, the life carve being auto win is wrong. Life carve needs the last hit to connect in order to hit. Even having max bonus gear and 200 luck I cannot hit Xan enough times to kill him after his full heal for instance. And Wake give -100 darkness resist which is not as useful as -60 all given that darkness is one of the most resisted elements. It does not se the targets darkness resist to -100 automatically. When I asked if there was any monster that could defeat DmK V1 (without one shot built in skills), I was told there were enemies in game that could beat it such as Razen. And this wasn't even in the the Inn but normal in game quests. I also never suggested that DmK V1 was not the best class in the game, I agree with you that it is. I was asking people to explain how a class with no defenses or accuracy boosts objectively better than a class with those boosts who can use +100 boost and -60 all resist to make up for the gap in damage. Yeah why can't I use a single skill that deals hp% damage to beat a boss whose gimmick is to resist that? Truly, V1 users are even more oppressed than gamers. Except Xan, Unraveller don't have gimmicks to resist life carve? And I am fully aware Xan can be beaten by DmK V1 (I got to do it just after release before DMK V1 was banned), That is not the point. I only said that because Life carve was said to be auto win against any enemy not coded to resist it. So I pointed out a time it was not (against enemies with high blind/shield abilities that prevent you from hitting). My point for starting this line of questioning is: DmK V1 is the best class in the game. Therefore there should be no scenario that it is not the best choice for (if allowed and without specific anti-DmK gimmicks like sentog). So if another class can beat a particular boss (enemies with high blind/shield abilities that prevent you from hitting) easier, then that does not make sense and can't be. So I asked f someone could reconcile these two conflicting statements. I'm sorry but where did all these DmK V1 advocates come from? Why are you trying to make out DmK V1 as a class that isn't broken? If you are complaining that you can't beat a certain boss with DmK V1 maybe it's because you might need to put a bit more thought into it than spamming one button and winning which is a strategy that still works against 99% of enemies. And Wake give -100 darkness resist which is not as useful as -60 all given that darkness is one of the most resisted elements. It does not set the targets darkness resist to -100 automatically. Incorrect. There are very few challenging bosses that specifically resist darkness. Also wake is loopable which sound blast is not. Also it doubles the damage output of a class that already has a natural damage boost. Why are you trying to make out DmK V1 as a class that isn't broken? I am not. Which I have stated multiple times. I am trying to say the opposite. I have repeated this multiple times. Nor have i ever claimed that life carve is not broken, only that certain bosses have abilities that render it not very effective. @Pelly 2500 I'm not sure if that's really a glitch. I think, but haven't really tested, that you get a mana regen for the turns your buffs would have lasted had you not overcharged them. But that's just my assumption, don't quote me on it. Hmm...I like the idea behind the Rainbow's Edge, but it would be nicer if we could have a weapon showing at the same time. It looks kind of strange having the line show up like that while running. Maybe if it was smaller? So it looks like it just fit in the hand rather than a stick of rainbow. I thoguth the glowing rainbows that zipped across the whole screen every time a new cutscene loaded were pretty cool. Conceptually I agree, but if that were the case the trail wouldn't match up to the size of the weapon 99% of the time. It's the "issue" that ChronoCorruptor has with this kind of effect; it looks amazing when it works, but looks kinda silly with longer / shorter weapons. Maybe a good compromise would be to simply have the item be a visible weapon of the perfect length with the trail attached, instead of the trail being attached to nothing. Or, if trails being a separate item slot is a possibility, I suppose we could simply have trails of varying lengths to match different weapons. Doesn’t this apply to everything? Paladin could have an amazing infinite 3% heal, but Bosses could have a DoT that takes away 3% of your HP every turn, so this becomes useless, and that does not make the 3% heal bad. Eternal Epoch is an amazing class for Boss Fights, however, it wouldn’t be recommended for (even though it has beaten, but will struggle to now due to Potion Nerf) Roirr and Ancient Duo, because it takes turns to set up. That does not make it a bad boss class. Ranger is an amazing class with Loopable 200 Crit and 3x Crit Damage. However, Argus Skywatcher gives it -200 Crit when Archdryad Malydrys is down. That does not make it a bad skill. Everything has, had and will have a potential counter to it, at some point or another, and this fact is inevitable. That does not make the item in question bad in any way. Everything will be rendered ineffective in some way or another. There used to be (but probably still is) a bug where going all the way up to Ultra Mana Boost in a fight will give you a Mana Boost in the next (and, if I recall correctly, all subsequent) fight(s) if you’re using Eternal Epoch. Maybe the same issue carried over to Base and Doom Epochs too? Or maybe it could be something entirely different. On that note, going all the way up to Epoch Mana Boost and then using Ultra Mana Boost gives you a pop-up number on the screen. This number is equal to the remaining duration of the Ultra Mana Boost, and it seems very weird. I also am that idiot who farmed for a Gnarly Guitar of Doom previous to last Mogloween, but Sold it because I didn’t know how the bank worked. 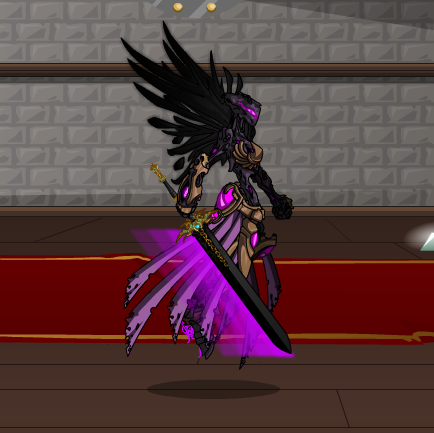 Now I’m stuck without GGoD fashion until next Mogloween, but at least I have Stormhawk. Would it be possible to have items like the rainbow edge have variable length matching the length of the weapon it is covering? Or would that be to time consuming/difficult to code? Or have cosmetic items have a series of preset lengths (short, medium, long) and have the item pick which ever preset length will best approximate the length f your weapon? EDIT: is imigur the best online image hosting site for forums like this or can someone recommend something better. While in a decently designed engine based on decently designed software, a single dimension such as length on trails would be easy to code, I suspect it would cause significant amounts of lag. In addition to this, I don't think weapons actually have any measurement of their length encoded into them. Doomknight V1 would provide an easy win button for the challenges; the spoils of which, I might add, are completely unnecessary for someone with V1 for any purpose, given how powerful the class is. There's also the issue that, if you have Doomknight V1, the rewards you might earn by using challenging strategies are simply slower and less advantageous to using V1, making it a penalty for playing the challenges as they are designed to be played. Of course, one might argue that it makes no difference what's available, since the experience of playing is the same... but this logic means that any aspect of the framework of a game is irrelevant provided you can do the same things in it. For example, if you could give yourself any amount of gold in-game within a minute, you could theoretically still farm for gold. But that would be time wasted. Essentially, games that just give every reward immediately with no progression or structure are not enjoyable for most players, since the rewards bypass the gameplay. In the same way, at least one member of this discussion has bypassed the gameplay using V1, and apparently doesn't understand the gameplay mechanics beyond life carving and nuking. Reminder that many discussions about Doomknight (particularly V1) are unlisted banned topics on the forums, for the same reasons as we've seen in this thread; it's commonly brought up by inexperienced players, and frequently leads to arguments. There are quite a number of players who self-challenge (Baron used to, though he's on hiatus, Erosion has his chickencow strategies, TFS does everything in every possible combination in every possible way except at low levels, I do low level DA and annoy TFS, etc.). But in terms of the challenge rewards, there is a minimum bar, and for the most part that bar is having a decent understanding of how the game works. 1. During the dreaming togslayer challenge, it was brought up that since DF is a single player game, people are free to play how they want and at their own pace and not affect other people (this was in response to mentions that the long nature of the challenge was more advantageous to people with more time and penalized people with less time). There is no rush to complete like in a multiplayer game or competition. This means that if a player wants to use any strategy the can. 2. I was not, nor did I ever, claim that life carve and nuke is the only way to play the game. I mentioned life carve because broken mechanics don't have any counters to them (not hard coded in) and thus it is weird that life carve did. This will be my last post on the topic, especially to not derail the thread further. Then having a few preset lengths would seem to be the better option. Just release 3 versions of thee item: short, medium, long and have the players buy one. Have a merge system like the timethorn matrix to so you can swap between them and don't have to play triple the cost? Oh yes, because game balance isn’t a necessity in Singleplayer Games by virtue of the number of players playing them being one in a given world. You can still play the game however you want to, though, and that’s not the question. Some strategies are undoubtedly faster and more effective than others, but none of them break game balance, but DmK V1 does. It shouldn’t exist, but it does because of Rolith’s inability to say ‘no’ to players who demanded that it be made stronger and stronger, and because of Alina’s refusal, to for whatever reason, make DoomKnight V1 a permanent unobtainable. Truly a match made in hell, unless it was Ninjaty threatening to sue AE if DmK V1 went rare that made it not vanish, but the point still stands that it’s broken beyond repair and needs to be outright removed from the game. That is not what i was saying at all in any of my posts in this thread or any other thread or post I have ever made. I brought up that point simply because like the dreaming tog slayer example how one person plays the game and the pace they do it at does not affect you. The game is not balanced for the DmK V1 class. Anyways at this point perhaps this conversation should be moved to the DmK thread, or that all classes discussion thread. Conceptually I agree, but if that were the case the trail wouldn't match up to the size of the weapon 99% of the time. 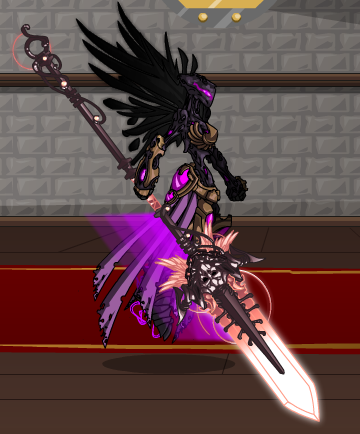 It's the "issue" that ChronoCorruptor has with this kind of effect; it looks amazing when it works, but looks kinda silly with longer / shorter weapons. Hmm, didn't think of that. I imagine it might be too difficult to have it scale to every single weapon; I can also see the possibility of it aligning with a body part, maybe? Like the entire length of the arm? The only classes that I can think of off the top of my head that might have an issue with it are GPS and the Monkey classes...maybe Chronocorurupter? I'm pretty sure almost every class was designed over the same arm base.